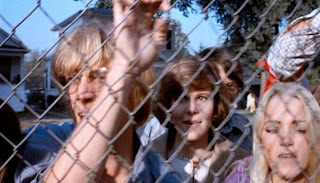 PART FOUR: In this 4-Part interview series actress Kim Darby talks with Justin Bozung for TV STORE ONLINE about her work in such films as DON'T BE AFRAID OF THE DARK (1973), THE STRAWBERRY STATEMENT (1970), THE ONE AND ONLY (1978), and THE GRISSOM GANG (1971). 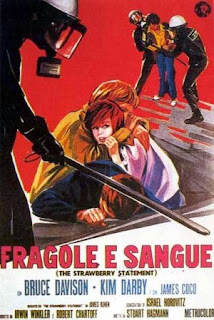 TV STORE ONLINE: How did THE STRAWBERRY STATEMENT (1970) come to you? DARBY: My agent, Bill Robinson, got me that role. I was "hot" at that time I guess. I had done TRUE GRIT (1969) so I had a window of time from that. Bill had heard about the picture, and it was written by Israel Horovitz. It was to be directed by this young director, and the picture was to be his first feature. I went over to MGM and met with [producer] Irwin Winkler. I walked in and the first thing I saw was this young blond-haired man leaning up against Irwin's door. It was Bruce [Davison]. He smiled at me and I went in and met everyone and that was that! TV STORE ONLINE: THE STRAWBERRY STATEMENT seems like it was such a departure for you in terms of the characters that you had played earlier. Did you see this "Linda" character in that manner? DARBY: No, I didn't. I really didn't think about her at all. 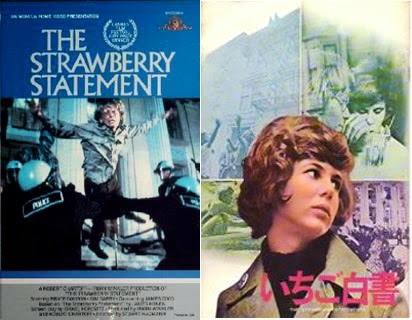 TV STORE ONLINE: When you were cast did you read James Kunen's book The Strawberry Statement? DARBY: Absolutely not. You see, I think it was Bruce Davison who got me that part in that picture. I think that after we met, he went to Stuart Hagmann [Director] and Irwin Winkler and said, "I want her." TV STORE ONLINE: Your performance in the film is very infectious. There is a electricity that comes through between yourself and actor Bruce Davison. Is there any truth to the rumors that the two of you were an item during the shooting of the film? DARBY: Bruce and I became very close during the shooting of the film. DARBY: Bruce was the first safe person I had ever been with. And he was very funny too. THE STRAWBERRY STATEMENT was also the first movie that I had ever done where I thought that I looked pretty on film. DARBY: I met her on the set. And I was shaken by our meeting. I had heard of what she was even though I hadn't read the book. She was a militant. DARBY: I knew you were gonna say that! (laughing) They just took us out there and we were given no direction. It was just improvised. We had a great cameraman and that was really what Bruce and I were feeling about each other at that time. TV STORE ONLINE: I love how the sequence is edited. The camera angle is staggering. I love that capturing of the occurrence of a real love on film....Was there any "acting" there? Or was it just visceral? I mean, am I watching two people really tell each other that they love each other for the first time? And on film no less! DARBY: I think we had already told each other that. But what you're seeing are real people in a real circumstance that just so happened to be filmed. We were just playing off of each other and it certainly wasn't by design. I didn't go into that moment with any plan. it was all instinctual. DARBY: He was very kind. He was lenient. He was a lot of fun too. He had done many commercials before, and there was the air of freedom around us. DARBY: I loved that too. TV STORE ONLINE: Was there any improvisation there? I love your line, "I wear Keds Sneakers and now I get laid..."
DARBY: (laughing) I think we came up with a lot of it on the spot. TV STORE ONLINE: The way that Stuart Hagmann introduced your character in the film in the opening minutes is pretty incredible as well..
DARBY: Yes. I learned about how actors need to be introduced in a movie from THE STRAWBERRY STATEMENT. It was just like how Omar Sharif was introduced in LAWRENCE OF ARABIA (1962). I'm not saying that Stuart Hagmann was trying to emulate LAWRENCE OF ARABIA--but the way he introduced me in the film really meant a great deal to me. He really did a beautiful job with that. TV STORE ONLINE: Do you remember anything about the scene between your character and Bruce's in that San Francisco record store? TV STORE ONLINE: That's a very special scene in the film for me...What was going on in your mind during that moment that the two of you share? DARBY: Nothing was going through my mind! When we were shooting that I remember just having the thought that it really wasn't even a scene. I just did it. But I was concerned that what we were doing--us playing around--didn't have any meaning! I didn't know if we really needed to reflect on ourselves there and I wondered if it was needed in the film. TV STORE ONLINE: What do you remember about the shooting of that big finale in the gymnasium? DARBY: That went on for several days, and I was very nervous. I'm very timid and I was worried because I knew that there was going to be smoke used. You can't control that many people in that situation. And I knew that those people were anxious to look dramatic. Pretty much, I just held onto Bruce in that and I got hurt. I was hurt by one of the cameras. The cameraman hit me in the mouth. He was very upset and sorry, but there are still photos of me on the set wounded. That ending--on those steps--where my character is dragged out? It was very frightening to me! For more with Kim Darby please visit her official website here.